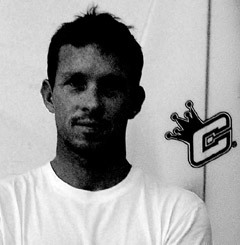 Clayton started shaping in 1994 as an apprentice at Safari Surfboards, where he learnt every detail of surfboard design from shaping to spraying. He was then tutored by Baron Stander where he honed his shaping skills and started testing new shapes and designs. Clayton is a surfer himself, and a good one. He surfed competitively for several years, and his personal experiments and the constant testing of his shapes makes him one of South Africa's most innovative surfboard shapers. Clayton's factory is on the Bluff and he has a well-stocked showroom in Milne Street, Durban. Team riders include Travis Logie, Ricky Basnett, Antonio Borrteleto and Rudy Palmboom, some of South Africa's top board riders. Clayton has a very simple philosophy that cuts straight to the chase: "To make quality surfboards, with all the best materials and equipment, without compromise."